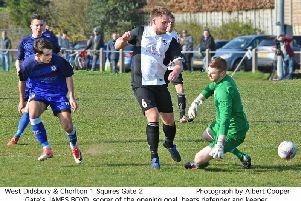 Gate stretched their unbeaten run to seven games in the Hallmark Security League but were disappointed to settle for a draw in east Lancashire, where they twice surrendered the lead and were left holding on with 10 men. Dean Ing gave Gate the lead before an impressive finish from Gary Burnett levelled the scores at half-time. Ric Seear put Gate back in front at the Ruby Civil Arena Gate on the hour only for Padiham to secure a point from the penalty spot. Gate manager Andy Clarkson welcomed Gary Pett back into the starting 11 for the first time since he sustained what looked a career-threatening injury in August. He formed a very strong-looking front three with Seear and Riccardo Egidi,who came into the game in great form. Both sides looked to attack in an even start and Gate went close after 17 minutes, when Egidi’s beautifully-weighted pass released Seear. He beat the keeper but his effort was cleared before it could bobble into the empty net. The visitors took the lead four minutes later, when midfielder Ing arrived late and rose highest to head home Adam Sumner’s cross. The game was scrappy but Gate looked set to hold their lead until half-time until Burnett intervened. Gate failed to clear a corner to the back-post on 44 minutes and the ball fell for the striker to hook the ball over his shoulder and into the top corner. Seear restored Gate’s lead on 61 minutes, when Joey Mullen’s lovely cross found the striker in acres of space at the back post to finish well into the roof of the nQt. But Padiham were level again 11 minutes later, when Dave Rossall was ad judged to have pushed Burnett in the back and captain Ben Hoskin held his nerve to fire the penalty home. Ing was shown a straight red card moments later for a challenge on Burnett but Gate survived the late onslaught. 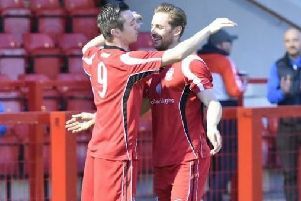 The point lifts Gate a place to seventh in the premier division with four matches to play. They play the next three in the space of six days, starting at Northwich Victoria on Wednesday. Gate: Povey, Mullen, Sumner, Davis, Rossall, Staunton-Turner, Ing, Boyd, Pett, Seear, Egidi; subs: Charnley, Bamba, Riley.